Escape to the Gold Coast for the ultimate seaside break at Horizon Holiday Burleigh Beach Apartments. Ideally located on the Gold Coast Highway, just a stone’s throw the idyllic Burleigh Heads Beach, and within driving distance from all of the region’s most famous and loved attractions, Horizon Holiday Apartments Burleigh Heads is the perfect choice for your next family holiday. Take your pick from our selection of comfortable, affordable and fully self contained one and two bedroom apartments, all of which come with private sunny balconies for making the most of the fresh salty sea air and near constant Queensland sunshine. Thanks to our ideal position, our 15 storey resort features stunning views out over the sparkling Pacific Ocean and the sprawling lush green Gold Coast hinterland. During your holiday at our family-run Burleigh Beach apartments, you can enjoy long, relaxing dips in the resort’s onsite spa, refreshing swims in the outdoor pool and invigorating sessions in the comforting steam of the sauna. With a children’s playground onsite, a fantastic games room and a wading pool for toddlers, guests of all ages are guaranteed a fun and relaxing time at Horizon Gold Coast Family Resort. The resort is located only 50 metres from the Burleigh Heads Beach, one of the Gold Coast’s most loved beaches. Take advantage of our prime beachside location to try your hand at body boarding, enjoy family games of volleyball on the beach, or simply kick back and unwind on the golden sand. When it’s time to eat, you’ll find everything from exotic Thai food to good old seaside fish and chips on offer in the cafes, restaurants and bars around Burleigh Heads. The only trouble is knowing where to start! 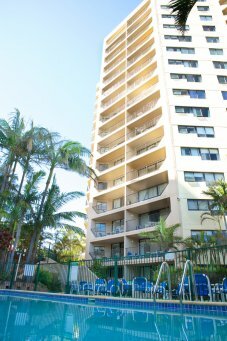 Book your family’s next break at our Burleigh Beach apartments today!